I’ve always lived in the Tuscan countryside, between Siena and Florence, near the Chianti area, in the same house where my father was born and my grandma was born. I am a country girl to the core: I love my quiet village, the woods changing colours as the seasons change. I love to be awakened by the birds singing jolly tunes. I even love the hard side of the country life, cold mornings in the winter and 10 km to the nearest shops. I see autumn coming when the leaves change colours, putting on fire the woods. I smell the winter coming: the smell of burnt wood in the fireplace welcomes me home more than a steaming cup of tea. I hear the summer coming from the relentless buzz of bees and insects in the fields. What about spring? 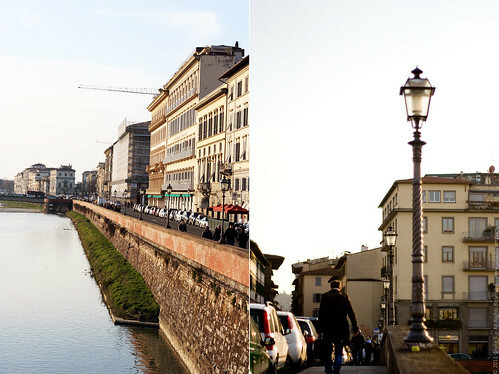 In spite of my passion for the countryside, I recognize spring coming in the city centre of Florence! In an lazy late winter afternoon you are there, walking with friends and chitchatting, casting a glance at the shop windows and commenting on the nice sunny weather when you are suddenly captured by a flower smell and you recognize that the air is changed. The air takes that indefinable colour that makes you say that, yes, there we are, we’re living the sweetest time of the year. Spring to me is flowers, the warm and scented air and the picnics in the garden. 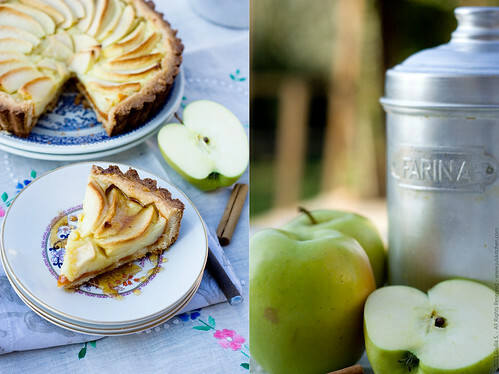 Enjoy a slice of fragrant apple tart and feel yourself plunged in a warm, lazy spring Tuscan afternoon. Sieve the flour with the baking powder and put it on a working surface, make a well in the middle and add the sugar, the salt and the grated peel of one lemon. Beat the egg in a bowl and pour it in the well. Mix the egg with the sugar using your fingers to make a soft dough. Add the softened butter and mix it to the egg and sugar mixture. When it is totally mixed, rub all the ingredients with your fingertips and make crumbles, then start kneading until you have a nice and smooth ball of dough. Roll it out roughly between two foils of parchment paper and place it in the refrigerator for at least 2 hours. Heat the milk on medium with the lemon peel: heat until the steaming point. Whisk the eggs with the sugar and flour. Remove the lemon peel from the hot milk and pour it over the egg mixture and bring back to the heat, stirring constantly with a wooden spoon. As soon as the custard is thick and veils the spoon, remove from the heat, cover with cling film and let cool down. Heat the oven to 180°C. Grease a 24 cm round baking tin. Take the shortcrust pastry out of the fridge, unwrap it and roll it out. To help roll the dough, keep the dough on top of the parchment paper and dust with the flour. This can help rolling the dough and can also help when transferring the dough to your pan. Grandma Menna’s Kitchen: Tuscan apple fritters Summer fruit pie with Jamie’s old-fashioned sweet shortcrust pastry An apple cake for Dario’s Food styling and food photography workshop Tiny apple cakes for the weekend. Your house will smell of orange, butter and Cointreau. A splendid tart! That picture of Florence is just beautiful. This sounds delicious, a lovely homage to spring. Thank you for sharing the reicpe. I am curious about the pasta frolla made with white spelt flour. Is it much different than regular flour? @ Domenica: thank you! the pastafrolla is not so different, I’d say a bit more rustic and nutty! I love to change the kind of flour into the pastafrolla, to test all the shades of flavour and texture! 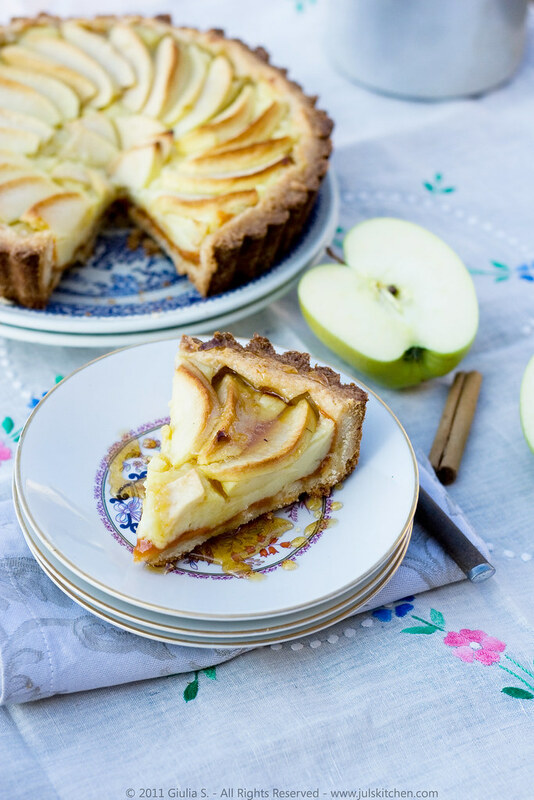 Your tart reminds me of my grandmother, I used to love helping her make her apple tart when I was growing up. I’m happy to see you featured on Honest Cooking, I’m a contributor there as well! Again Giulia! This recipe looks stunning! I don’t eat wheat, so I’m very excited by the fact that you’ve used spelt flour – I love it’s texture but wasn’t sure how to make pastry with it (I was actually thinking about it today) what serendipity that you’ve posted this! Thank you!!! The lemon peel in the custard would be beautiful as well! I can’t wait to try this recipe – I might make it for my family’s Sunday dinner this week! 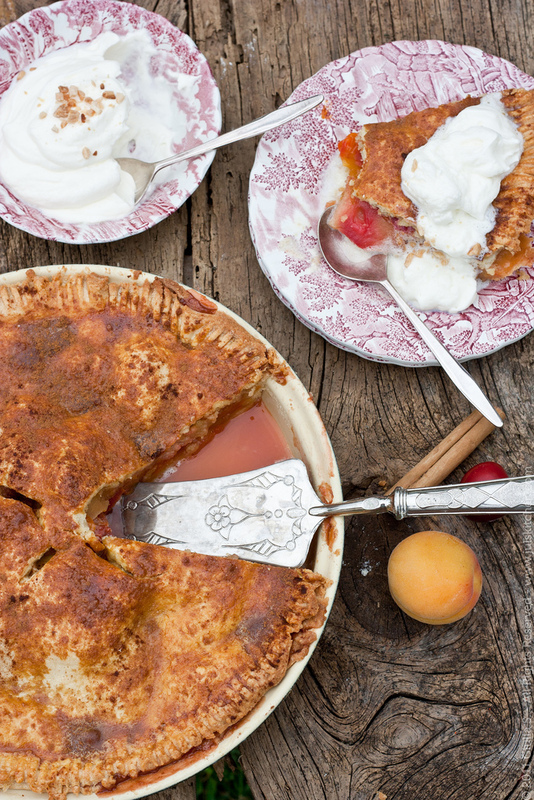 The tart sounds delicious and your pictures are gorgeous! This looks so delicious! I can imagine picnicking on the Tuscan countryside eating this tart and drinking LOTS of vino 🙂 Your photos are lovely, too! 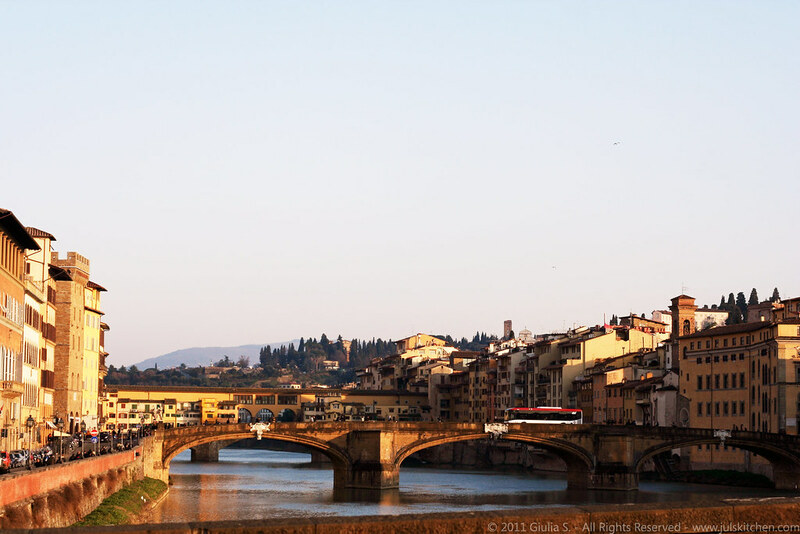 Makes me want to go back to Florence!! 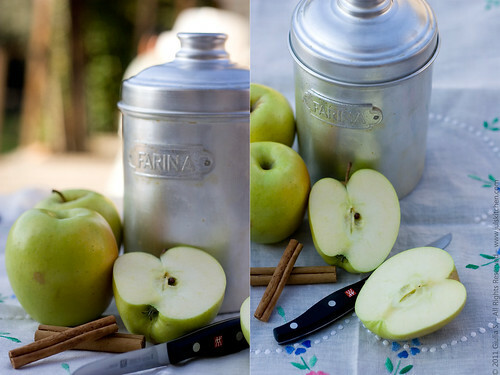 Giulia – Came to you from Honest Cooking – i think Kalle has done a fabulous job. I will be contributing as well in the short future. 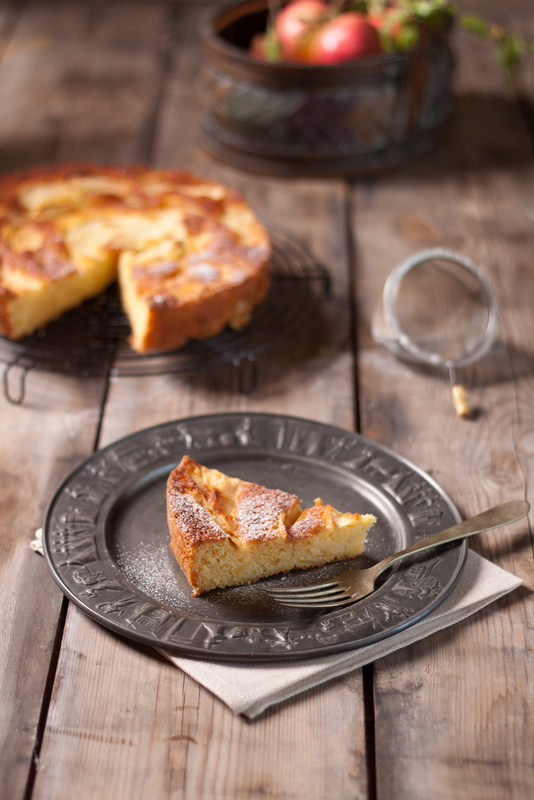 I love your site, your picutures and this tart just looks fabulous. Nice to find anohter great food blogger. Happy Spring! I love your tart. It’s beautiful! Beautiful and packed with flavor. So yummy. I love love this recipe. can I use all purpose flour instead of white spelt flour? Sure! It will turn out perfectly!